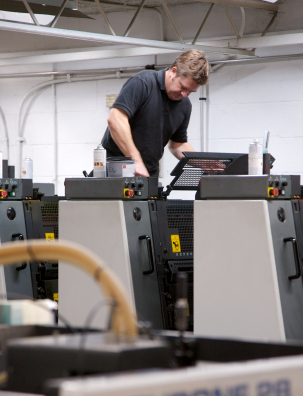 With two decades of press experience, Matt brings extensive knowledge of printing to all projects in which he is involved at Saturn Printing. Matt came to Saturn Printing in 1991. "It's rewarding to see what you can do. I get a certain satisfaction out of a job well done here at Saturn Printing," he says, "A lot can go wrong, so I need to stay on the ball. We work together here, and I think our customers see this is in their final product." When Matt is not running the press at Saturn, he is playing guitar, writing music, and enjoying time with his friends.